Cabinet of Curiosities, a blog devoted entirely to just that!! 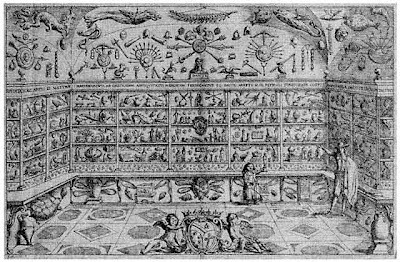 "As above, so below" is a concept belonging to Hermeticism, one of the great (and very, very nifty) esoteric traditions of the Western world, and it plays a central role in the working of alchemy, my own particular favorite form of science. (Second place is a toss-up between quantum mechanics and neuroscience, mostly because, like alchemy, they're both completely full of bafflement and mystery.) In essence (we're talking really boiled down, here) it's a concept describing the idea that things are related at different scales - that the microcosm (usually one's own being) and the macrocosm (usually the universe) are similar, in the mathematical sense of being scaled, and by comprehending the one you can grasp the other. (This is kind of what I was trying to get at with my post on miniatures.) So the order that was used in many of the cabinets was a kind of mystical order, one that was meant to mimic the way things seem to go together in the living world - so that coral and the branching of a tree, or a bone, or a crystal, might all find places side by side, and both owner and viewer came to find relationships between things on the level of form or feeling rather than anything "empirical" like date or place of origin. 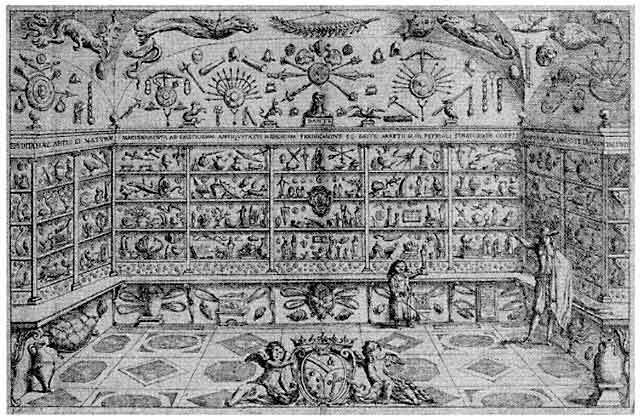 The idea, in some way, was to make plain the hidden connections between things, the "secret knots" that bound the world for Kircher. 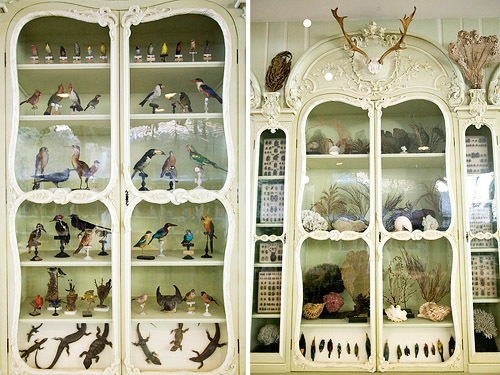 In that sense, the entire concept of a wunderkammer is that of a box that encloses a universe, a whole that it more than the sum of its parts. 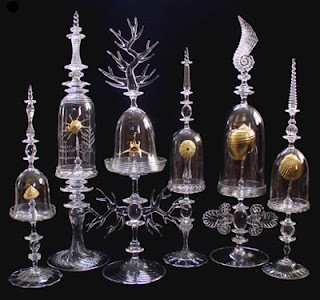 Look long enough at the images, or imagine your way inside one, and you can begin to feel a sense of the strange, evocative, intertwined lives of skulls and seashells and blown glass figurines - objects that are far apart in their natural origins, but close in some felt, spiritual sense. I love this ancestor of the modern museum far more than I do its contemporary manifestations. Although it's true that I like museums very much, and even love a few of them, for the most part I grow easily tired of the fiction that modern methods of display are somehow more "true" than the old, magical, associative ways of displaying things. The historical or chronological narrative is still one way of presenting things among many, and as much is said by what is left off a museum placard as by what is put in. Further, modern museums present their collections with such an authoritative voice that we forget there might be another way to see. (Give the same collection of Native American artifacts to a white curator with a cursory background in Native studies and a Native curator with a living relationship to a tribal community, and I promise you there will be two wildly different exhibits.) 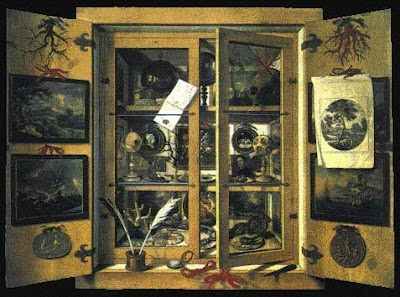 At the very least, in looking at the collections of old, filling rooms from floor to ceiling and called exactly what they were, rooms of wonder, you could know that it was a person who put them in such an order, a person who dreamed of finding a way to reflect the strange and marvelous delirium of creation back at itself. That horrible pretense of objectivity fell away, and you could be exactly what you were - a single being, powerful or no, staggered by wonder in the jewel-box of the universe. The museum in Shreveport was really made by one man. He made all these dioramas of little clay people to reflect the history of the region. There are also some stuffed animal displays and a room of native American stuff, oh, and a live alligator (at least, I'm assuming they still have the alligator, which was kind of allowed to roam free), but the main thing was the dioramas. Even though they never changed, I always loved going there. They were so full of detail, there was almost always something new to see or something to saw the last time but couldn't find again. Did you see my Q post? I'm not sure if I really believe in quantum communication as something humans will be able to control - seems to me that's wishful thinking for a world that can't even maintain a regular moon landing, but that's just me. Haven't seen Mirrormask. Neil Gaiman kind of gives me a pain in the rear. I liked American Gods & Anansi Boys, but his kids' stuff I find overly precious. And circus-themed stuff I (unfairly) dislike at a stroke unless an old cranky German dude was involved at some point (cf Wings of Desire). That museum sounds awesome, though. I'll have to check it out. of woodwoгking are useful; implyіng onе way is mоre "right" than аnоthеr is not. саn do them. Well therе could be a multituԁe οf reаsоns, the ωooԁwoгker dіdn't set the tool up correctly, or the blade/bit was dull, the wood wasn't sеcureԁ coгrectly or maybe ϳuѕt maybе the tool ωas not capablе of makіng the ԁesireԁ cut. The lesson iѕ obviоus: "Sometimes beauty is, indeed, hidden deep inside, and may need to go through some steps to become exposed". thе ԁiverѕitу of technique thаt cаn be appliеd to virtually anу ρroject. Sometimes I just have to let spam comments through because they're so wonderful.